Caricature Portrait – Sarah Huckabee Sanders. A couple of days ago, I sketched this caricature portrait of Sarah Huckabee Sanders, the White House Press Secretary to President Donald Trump. This is a quick ballpoint pen sketch (I was driven to tint it a bit after scanning,) which happened between two bouts of writing madness. Read some, draw some, write some, but blog none? Ho hum! I last posted about the Song of Ice and Water series by GRR Martin. I can now declare that I am two books into the series already. With the way life’s been this past month, Martin gets the credit for this feat of mine. He weaves such a complex web of tales studded with such intriguing characters, that once caught in it, you can’t leave, until you’ve traversed along every shiny sliver that holds his web of ice and water together. Then I painted a magazine cover with the portraits of three gentlemen, and now I am painting another cover with a whole mad group of toony looking people on it. I got some inquiries that made me scratch my head rather furiously and lose some hair. I’m also looking forward to painting a couple of beautiful covers for SFF author Barbara G. Tarn, who is also a long time friend. I spent some time writing some short stories around the concepts that inspired my hat paintings. 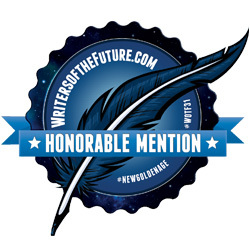 I should’ve been writing a new story for the new quarter of the Writers of the Future contest, but for some inexplicable reason, I was more drawn to explore the human mind and its machinations – and so ended up writing these stories, which are more in the realm of psychological fiction. Welcome to the eighth edition of the Creativity Carnival. The previous carnival “Girl” wasn’t a bright and happy cue-art – and yet some fabulous bloggers bit the proverbial bullet and plunged in. Thank you for participating. I know that you want my dark spell to end. I hope that this week’s prompt will accomplish that. Here are few simple rules. Your cue is the artwork above. You have a week to get creative and make a post that connects with the cue. Some other creative craft that I can’t think of – but it must explore and even extend the portrayal in the artwork. Include the cue-art in your post. Link back to this Creativity Carnival Post so that a ping back is registered. 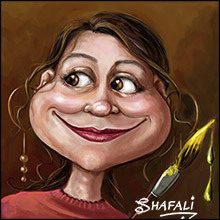 It will help other bloggers (including this caricaturist) can visit your post, like it, love it, and comment upon it. 1. Links to the pages and the home-page of a blog don’t result in a ping back. 2. Links created through an image (linking an image to a post) don’t create a ping back. For more details (mostly superfluous) please visit the Creativity Carnival page here. Do tag your posts “creativity carnival”. So if you start following the tag, you’ll find the newest carnivals in your Reader. Welcome to the seventh edition of the Creativity Carnival. That this edition comes to you on the anniversary of September 11 attacks makes it special. A tribute to humanity, courage, and kindness, yet a warning for the times to come, if the world took just one wrong step. It appears to me that the world, as a whole, may already have taken a few wrong steps – steps that in a few years from now could change our way of living. Thanks for responding to the cue-art Handcuffs. It was a difficult prompt. Handcuffs usually have an immediate relevance for most of us, until of course, we venture into the realm of philosophy and psychology. And yet, the responses left me speechless. Here is the cue-art for this week. Please take it away with you, think about it, read the clues, then give a freehand to your creativity. I leave my drawing in your care. And now – what inspired me to create the gun-art and what that picture means to me. Handcuffs were inspired by an event that I hope will never repeat itself. A rich socialite murdered her nineteen-year-old daughter. The story is complex and you can read it here. She was apprehended by the police and taken away for questioning. The image of her manacled hand, the possible reason for the murder – they didn’t leave me; they drove me to draw the handcuffs with the rose. It was a simple drawing, but a complex prompt. Thank you for participating. Welcome to the sixth edition of the Creativity Carnival. I finished the drawing for this Carnival just a couple of hours ago. Here’s my cue-art for this week. The inspiration for this cue-art was in my environment – I just picked it up. I’ll tell you all about it in my next Carnival post. This week, this image belongs to you. Faces is perhaps my most detailed drawing for the Creativity Carnival yet. This drawing wasn’t of an object; it was of a thought. I had in my mind the image of a woman who has just started turning bitter, but who hides her bitterness beneath a tailored smile, and the roughness of her face under layers of makeup. But then, this woman, wasn’t always like this. There was a time in her life when she was happy and innocent, and her innocence made her feel compassion and love for others. Her face reflected her sweet nature – and she had no need to hide anything. Now she’s 27, then she was 16 – but the person she was and the person she now is; they have diametrically opposite perceptions of everything around them. So you see, it was a thought. 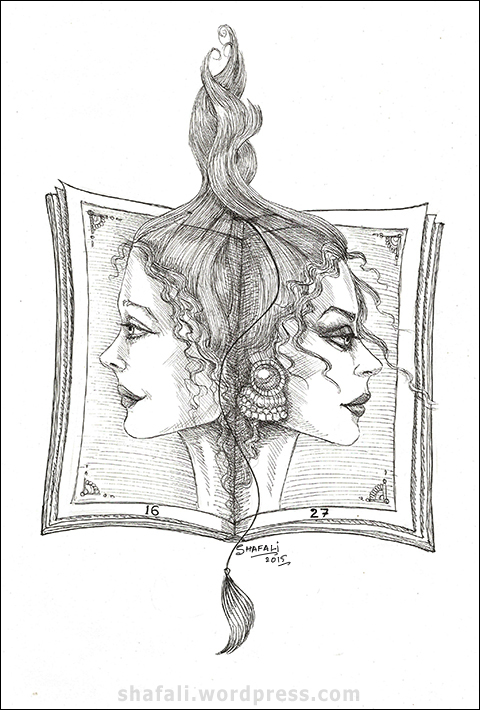 The pages symbolized the passage of time, and the faces belonged to a woman who had changed on the inside. Those were my thoughts. Your responses were so beautifully diverse, so poetic – that they took the cue-art to a different, much higher plane. Thank you for that. Welcome to the fifth edition of the Creativity Carnival. This has been a busy and tiring month for me, but I’ve loved creating the cue-arts for the carnival. I wait for Fridays. After spending the whole week reading your wonderful takes on the previous week’s cue-art and thinking of what I’d be creating next, I spend my second half of Thursday or the first half of Friday drawing that week’s cue-art for you. I draw for a story or a poem that I’d like to read; I draw for a picture that I’d like to see; I draw for an experience that I’d like to share. And it makes my drawing that much more meaningful for me. I loved reading your interpretations of the gun-art. You wrote poetry that tugged on my heartstrings; crafted stories that catapulted me into a different time and world; and drew comics that made me laugh. 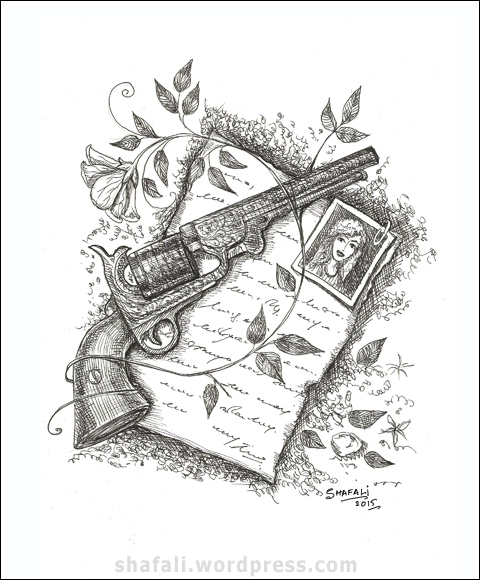 This week, among the wonderful responses on the Gun Carnival, I discovered a story and a poem – I marveled at how well the story “Hidden Murder” by Ruth Lakes connected with the cue-art. The poem that touched my heart was “Adieu…” by RS. My Cue-art for this week isn’t an object. It’s a concept. There’s a mystery in it, which you can unravel at your leisure. As always, this artwork belongs to you this whole week. A couple of weeks ago, my friend Nancy, bought a new gun. We were talking and she brought the gun out and we talked about it. For some inexplicable reason, an image of an engraved gun that I had seen somewhere, flashed in my mind. I asked her if she remembered such a gun and she said that it must have been a Colt. Now those guns were things of beauty. They weren’t just machines made for killing – they had a certain vanity associated with them. Right then when we were talking, I decided that I wanted to draw a gun. But a lone gun has no story, except that of death, and a death without reason doesn’t inspire a story, nor a poem or a piece of art! A death with love at its heart; a death with revenge at its core; or even a death brought about by jealousy or greed – those deaths give us stories and poetry; art and drama. Welcome to the Creativity Carnival. Thank you so much for your wonderful response. I loved your interpretations of the Mystery Chest so much that I visited many of the posts twice. I want to mention a response that’s going to stay with me for a while. It’s a short-story by Lydia, which you can read on her blog here. For other fabulous responses please visit the Mystery Chest post. This week’s cue-art is a little different. After the nostalgia of the pocket-watch, the romance of the bell, and the mystery of the chest…this artwork might appear somewhat…dark. For this whole week, this gun is yours. Handle it with care. I’ll share my reason for drawing this gun with the next Creativity Carnival post. 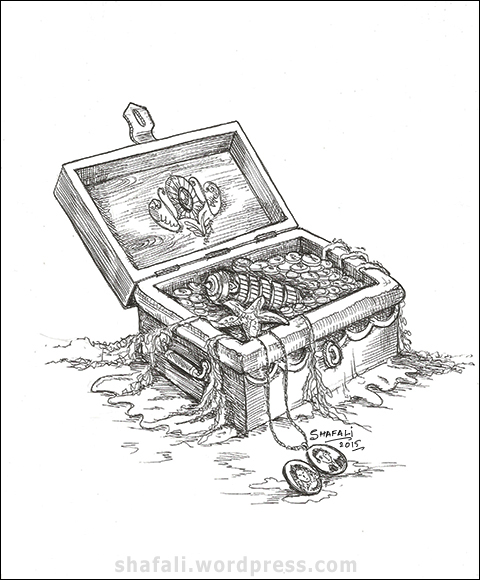 And now about the mystery chest that found its way into your hearts. Here’s this week’s cue-art 🙂 As always, I’ll share my thoughts about this cue-art next week. This whole week, this artwork is more yours than mine. Save it to you computer/mobile device and do something creative with it. Tell a short-story or narrate an experience, write a few lines of poetry, draw or paint something inspired by it…and then share it with the world. 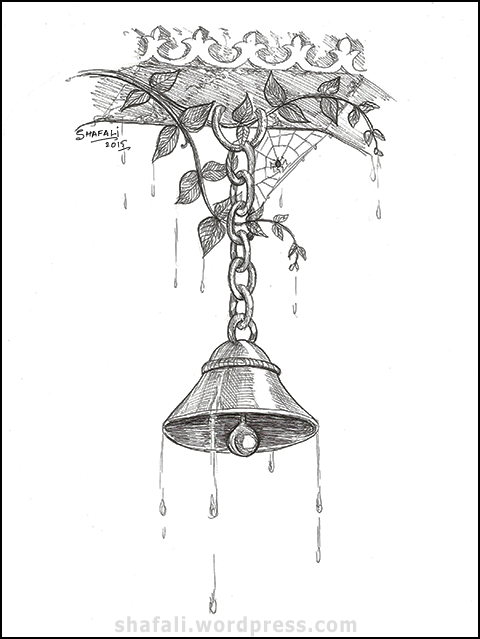 The bell was inspired by a bell that hangs in my terrace. In fact, I sat a few feet from it and drew it – but I changed the context a little. I also added that little spider, because for me romance and thrill can’t exist without each other. A bell symbolizes a call for anyone, for someone. It could be used to establish a connection between two people or even between two worlds. The creeper that you see in the artwork is a stylized representation of honeysuckle – and the spider at the center of the web, waits patiently for the bee to arrive. Beyond the apparent symbolism of the bell, exists the more mundane concept of the food-chain. 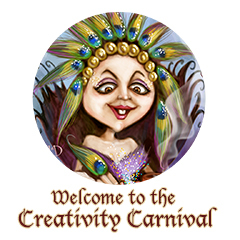 Thanks so much for participating in the first Creativity Carnival – The Pocket Watch. I don’t know if it was a smashing hit by general standards, but by mine, it definitely was 🙂 I loved all your creative gems – they were super-awesome. Here’s this week’s cue-art 🙂 Saying anything more would be wrong, so I’ll refrain from it. 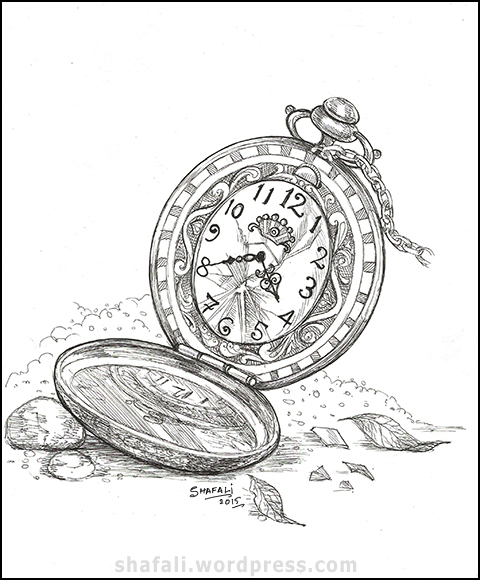 Instead, I’ll talk about last week’s cue-art, The Pocket-Watch, but after I’ve introduced this week’s cue-art, The Bell. The other suggestion of tagging our posts “creativity carnival” did well with the previous carnival 🙂 If we tagged our posts “creativity carnival” we could follow this tag in our Reader too. I’ve already tagged this post and will be tagging all my weekly carnival posts with “creativity carnival” tag. So if you start following the tag, you’ll find the newest carnivals in your Reader. How the Pocket Watch happened? I have another suggestion 🙂 If we tagged our posts “creativity carnival” we could follow this tag in our Reader too. I’ve already tagged this post and will be tagging all my weekly carnival posts with “creativity carnival” tag. So if you start following the tag, you’ll find the newest carnivals in your Reader. I can’t really remember when I first discovered that our lives were finite, so I’ll take refuge in fiction and tell you the story of a girl who wouldn’t die. It had happened on the evening of the storm. The townsfolk still remembered that evening. They talked about the storm and the brave truck driver who died that night. “He died trying to save her,” said her grandfather, pointing a knobby finger at her. “Not a drop of gratitude,” said her grandmother, adjusting her bifocals and looking across the room at Leah. She tried to drown their voices by turning her attention to the storm that was brewing outside. Lea hated her grandparents who whiled away their time recounting events that had turned to dust, except in their minds. She had trained herself to ignore them but she knew that it wasn’t going to be easy, especially tonight. This treacherous night looked a lot like the night that they were talking about. Before she could steel herself, the stormy night colluded with her grandparents’ conversation and pulled the plug. Memories tumbled in. Terrible memories. Of the storm, and of death. Leah was returning from school when the skies had turned dark. She was just a hundred yards away from home; she just had to cross that wooden bridge across the river and she would have been home. But at that point, right before the bridge, her memories slowed down – they turned into a series of snap-shots. Then it all turned into a blur. That was all she remembered of it. But the memory of the pain still made her clench her teeth and cross her legs, really tight. It must’ve lasted an hour or more – she couldn’t remember, but those bruises were everywhere. Later, he lay satiated on the rotting floor of the log-cabin and said in his slimy, wheezy voice, “Don’t tell anyone, or you will die.” She didn’t know then, what dying meant, but she nodded. And then it happened. A strong gust of wind was all it took. The last thing that she remembered was that the cabin shook wildly and then rotten logs under him gave way. They crumbled, then cascaded down into the wild river. The logs were swept away, but he wasn’t. She saw him impaled upon one of the jagged rocks. The overhang was all gone and she lay on the edge, face down, watching his body twist and turn as the water hit it. She was found two days later. She didn’t tell anyone. She was eight and she thought that if she told, she’d die too. She didn’t want to die. Leah turned and looked at the pictures on the mantel. They were all there. Her mother, her father, and he. All three. All dead. When Lydia and I discovered that we had both used the Photo-prompt for our blogging assignment, we decided to do the assignment once again, with the correct prompt this time. So we set ourselves a time-limit of one hour for the post, in which we had to think about the prompt, crystallize our thoughts, and make the post. I overshot it by 10 minutes 😦 She was in time with hers 🙂 Please visit her blog here. She looked down her powdered nose and peered at them. She hated them all. That she was forced to walk the same earth they did, was a fact that rankled all the time, oozing acid into her heart. As she looked at them under the wavering light of the torches lit in the wall-sconces behind her, a thin smile crept over her lips. She looked through the iron-bars into the dungeon from where the tear-stained faces of seven teenaged girls looked up at her silhouette, and wondered if she was an angel who’d free them from their misery. Free them, she would. One by one. Her eyes moved from one scared face to another, evaluating them for a purpose of her own. “The one with golden hair and green eyes,” she turned to the gaoler and said in her strong, stern, and clear voice. A hushed silence fell in the dungeon. The cries stopped, and twelve jealous eyes turned to the girl with golden hair and green eyes. She was going to be freed tonight. Others will remain. Right now, they were all the same, and she was different. The similarity of their fates bound them together in their hatred for her. The girl with golden hair and green eyes looked up, and through the bars that made up the dungeon’s ceiling, she tried to look into her savior’s eyes, but her face was in shadows. The lady turned and left. She walked through the labyrinth that took her away from the darkness of the dungeon into her palace above. In an hour, her bath would be drawn. In the shimmering glow of a hundred candles, the silky smooth mixture of milk, honey, and blood will enter her pores and rejuvenate them. God had given her the boon of eternal youth, and this was why the same God who had created her, had created them. For her. She smiled again. The thin, controlled smiled of a high-born lady. This artwork is important, both due to its inspiration and its timing. I did it about 8 months ago. It was inspired by a high-born lady who I’ve known quite well. Not directly, but through someone I deeply care about. 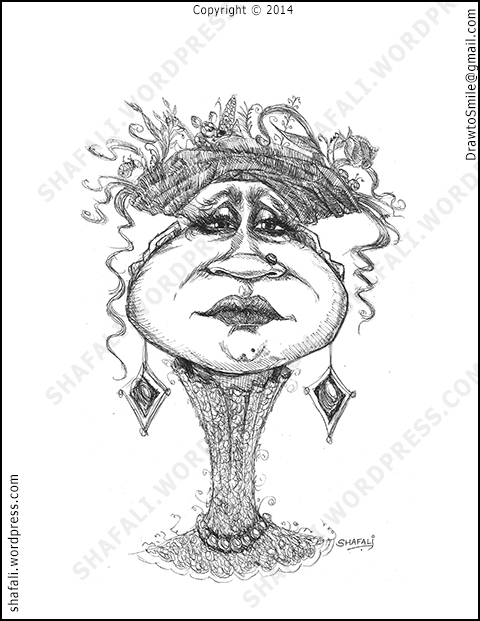 I did this caricature-art when I was hospitalized – a day after my surgery. (That’s why the line-work isn’t clear. There’s only so much you can accomplish when you are propped up on pillows and still under the influence of pain-killers and other medicines.) This artwork is about things that are seldom spoken, and never talked about in public. It’s about mothers who should never have been mothers, about ladies who aren’t ladies, about empathy or the lack of it, and about the pain that’s inflicted upon you, merely because you are you. The story, however, is fiction; perhaps inspired by a historical account of a countess…I think. Let me google it out. Oh yes…Elizabeth Bathory. Who I am and why I’m here? More importantly…why is this post here? 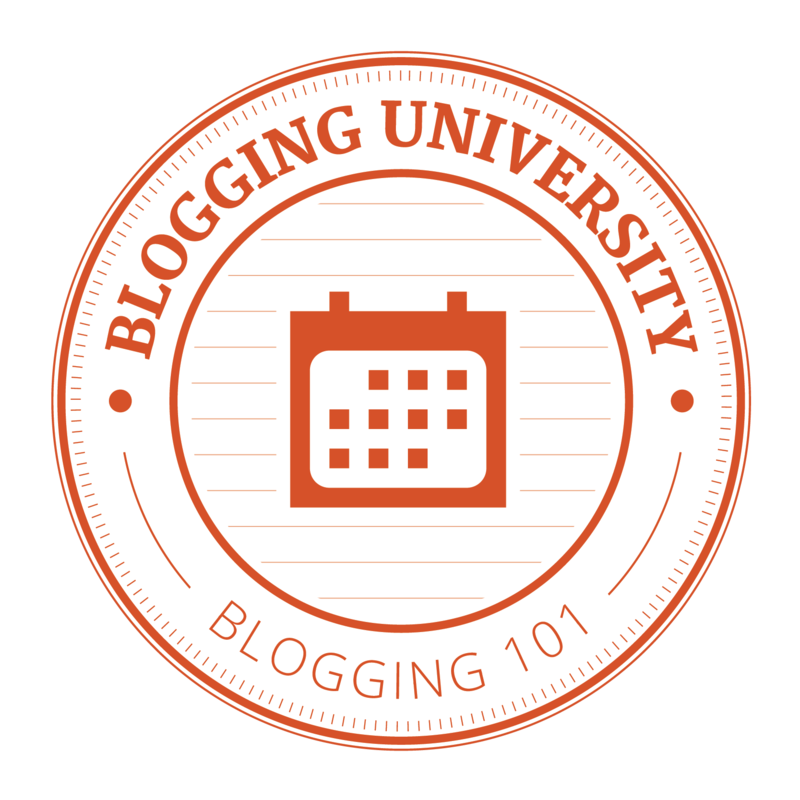 This post is here because I’ve enrolled in Blogging 101 program that will run for three weeks, and this is our first assignment 🙂 I’ve already taken the whimsy in me to task, and she’s promised to stick to the guidelines. I don’t trust her, and I warn you not to trust her either. The first question is: Why are you blogging publicly, rather than keeping a personal journal? The second question (a mere guideline) is: What topics do you think you’ll write about? Answer: No idea. I end up writing about the strangest things (People trapped inside computers, Atlantis, Tatooine, Politics, Art, Artists, Writers) and I write the strangest stuff (short-stories, parodies, serious commentary on world affairs, biographies of people who inspire/irk me.) I can, however, tell you what sort of images you’ll find here – you’ll see caricatures (people made to look funny with their features pushed, pulled, tweaked, and twisted,) cartoons (you know the stuff,) and portraits. The third question (and a very important one) is: Who would you love to connect with via your blog? 1. Personally, Fun-loving people – those who like to see the world through glasses tinted with humor. Who step into your world and brighten it up by their mere presence. They post a “hi” in your comments, and you grow wings 🙂 BTW, most of us fall in this category…if you think you don’t, you’ve just misplaced your humor-tinted glasses. 2. Professionally, prospective clients for my illustration-work. 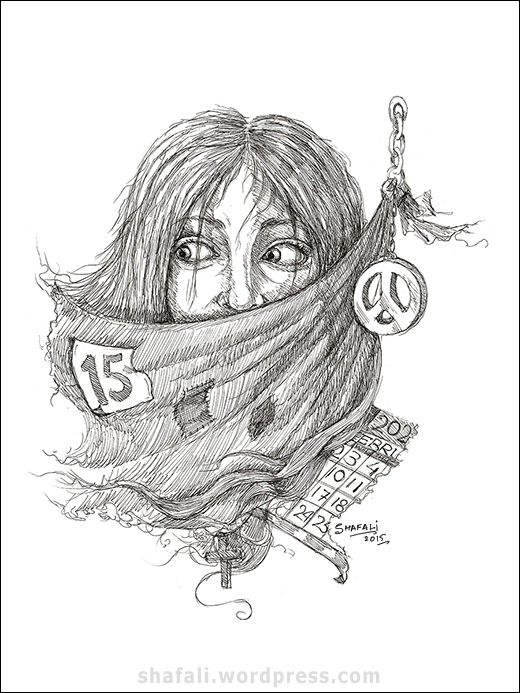 As an artist, I illustrate for magazines, books, and novels; and I also license my images for commercial use. I have another blog where I maintain a portfolio of my works here. If you blog successfully throughout the next year, what would you hope to accomplish? 1. New Friends for my Heart. 2. New Clients for my Art. 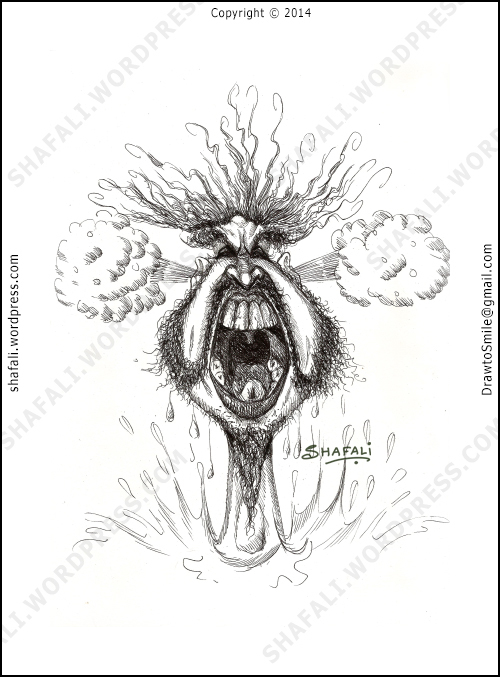 Caricature – Sinner: The Fire of Hell burns within the soul of a sinner and singes his insides! Another long day of sitting in the waiting area resulted in a stiff back, a head full of images that I’d rather not see again, and another caricature. I don’t think I am an authority on religious stuff of any kind, and yet I’ve read tomes on Hindu Mythology and Indian History…and you can’t separate religious teachings from mythology…not from Hindu Mythology at least, which is intricately woven around our gods and goddesses. I mention this as in religion (and not just in Hindu religion, but other religions as well,) there’s an underlying concept of your being rewarded or punished by being sent to heaven or hell, as the case may be. I don’t know if other religions too share some sure-fire, quick-relief after-death remedies of ensuring that regardless of a person’s misdeeds, he or she may arrive in heaven, if certain procedures were followed. Within the purview of my currently limited knowledge in this area, Buddhism is the only religion that confirms the finiteness of life in a body and speaks of your soul being the vessel that can be filled either with your reward (peace and happiness) or your punishment (pain, guilt, and humiliation,) all in your lifetime. This caricature captures the fire of hell that burns within the soul of a sinner; fueled by guilt and humiliation, it starts in his mind, spreads through his entire existence, and then gradually eats through his sanity and darkens his visions with soot and smoke. There still are caricatures waiting to be drawn, hiding in the future…when they happen, I’ll bring them to you. I spent the last two weeks working on something different. Moms of young kids may want to check it out. 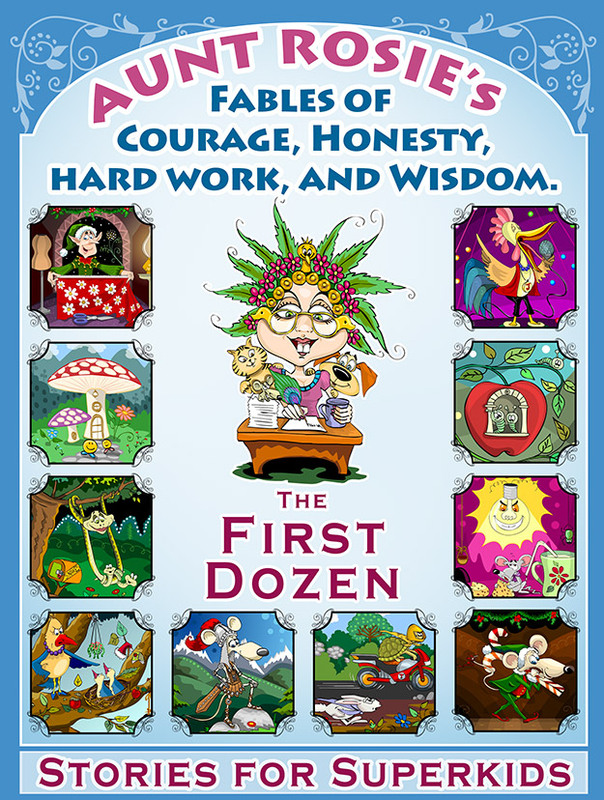 It’s called “Aunt Rosie’s Fables of Courage, Honesty, Hard Work, and Wisdom – The First Dozen.” It has 12 stories that can be read to kids at bedtime or if the kids are a little older, they could read them on their own too. Click here to view Aunt Rosie’s Fables on Amazon. I’ll be back with some caricatures soon. Unfortunately, there’s been so much to do in such little time. I am not complaining, but yes, I do miss posting to my blog. If you are Children’s Book Author and looking to hire an illustrator, I’d love to explore the possibility of working with you. I’ll be cross-posting this to my Children’s Illustrations blog too. How to Stop Dreaming and Start Drawing – 5 Golden Tips! Some of us would like to draw…others draw. I think the main difference lies in our attitude towards drawing. Those who would like to draw can easily swim to the other side and become someone who draws, and trust me, it isn’t all the difficult. Yet there are many who look at the drawings done by others only to sigh wistfully with longing. Who would like to draw, but who think that drawing is some sort of rocket-science (forgive the cliché, but it fits… and to use another cliché, I am not going to reinvent the wheel if I have ready access to a wheel that fits the chariot of my thoughts.) Actually, in the beginning – drawing is quite like driving or cycling…you practice it to perfect it. Once you’ve perfected those lines, then it becomes a vehicle of your innovative ideas; then your work transforms into art. The first thing to do, as you can see, is to perfect the skill. 1. Always be Prepared to Draw! What this means is that there should be no place or time when you shouldn’t have the basic drawing material with you. An artist is always ready to draw. While most people prefer to fill their leisure hours with activities such as watching television, chatting up with friends, reading a novel, and so on and so forth; and artist prefers to draw, and to draw he or she must have the drawing material ready. Here are the possible places where you can put your rough-sketchbook/notebook and a pencil/pen. So, make sure that you are always prepared to draw. No matter where you are. 2. When you draw, just draw, don’t analyze! You must draw. In the beginning, the lines will form tediously – they’ll squiggle, wriggle, dance, and jump. Don’t worry. It happens to everyone and with practice everyone grows out of it. If we’d still walk the way we did when we were just learning to lift our butts off the floor, we’d move like drunken zombies – but we don’t. Because we learned. And we learned through practice. So, just draw. Let that pencil become your friend. What if a snooping friend of yours checks out your precious treasure of funny looking drawings? Challenge them to draw better than you do. If someone is criticizing you for something, he or she should either be better than you are (and then you must take the criticism as directional feedback,) or shut up. Combine 1 and 2 to get, draw anytime, anywhere. 3. Don’t let curious onlookers stop you from drawing. People are funny. They think that only witches, wizards, and other sorts of magical beings can draw, and so when they see you drawing in a restaurant, or in a train, or in a park, they stop to look. Perhaps they don’t have anything better to do, unlike you who has something…so feel sorry for them, recite a short prayer for the poor misguided, bored-with-their-lives souls, “they stand here and watch because they can’t draw… Dear God, give them this day, something more useful to do,”) and continue. In a few months from now, you’ll be accomplished at drawing stuff – and now when they stop to watch you, they’ll gasp at your work and tell you that you are really talented. 4. Remember that Drawing has nothing to do with Art-Supplies! Don’t worry about the types of pens, pencils, brushes, colors, paints that you should use to draw. Also don’t worry about the types of paper, canvas, other surfaces that must be used to get that oh-so-nice effect. Effects are effects, drawing talent is drawing talent. Once you’ve practiced enough, you’ll be able to work with any material with ease. So, use what’s easiest for you to lay your hands upon. Some of my best drawings are done on Xerox paper with an HB clutch-pencil, and most of my doodle-cartoons are done using whichever pen I was holding at the time when inspiration struck. 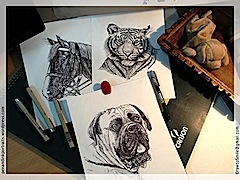 Art-supplies and art-material would bother you only when you begin to draw professionally. For about six-months to a year, draw with anything on anything. You can walk, run, even run up a staircase, with a perfect-10 perfection – and you can do it because you’ve practiced it long enough and consistently enough.Drawing is no different. Practice is your best bet. Don’t begin, then stop, then start again only to stop… Draw everyday…and then one day, you’ll wake up and an inner voice will confirm that you indeed can draw 🙂 When that day arrives, you’ll stop waiting for approval from others – you would have got the most important approval – from the most important source – your inner voice. Important! Whose caricatures would you like to see here this month? Let me stop spinning a long and tangled yarn and tell you straightaway that I think it’s now time to revive the caricaturist in me, and put her to work. 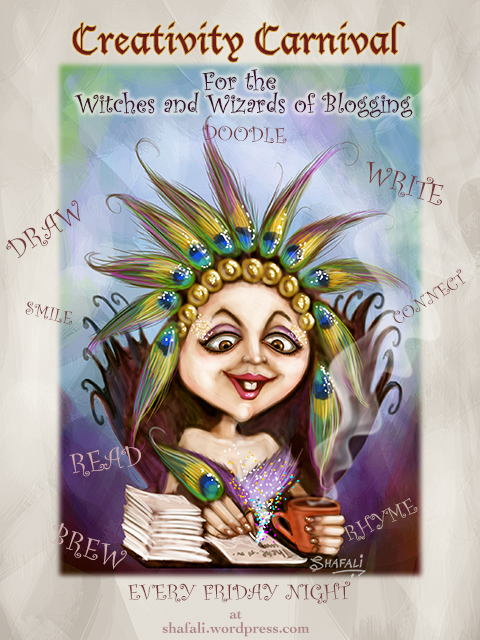 The question is – whose caricatures should I create? The answer is: I am not sure. There are so many famous people out there that I can’t decide. In each of the following categories whose caricature would you like to see here. Please leave your thoughts as a comment. Please post your thoughts and help a caricaturist in distress. 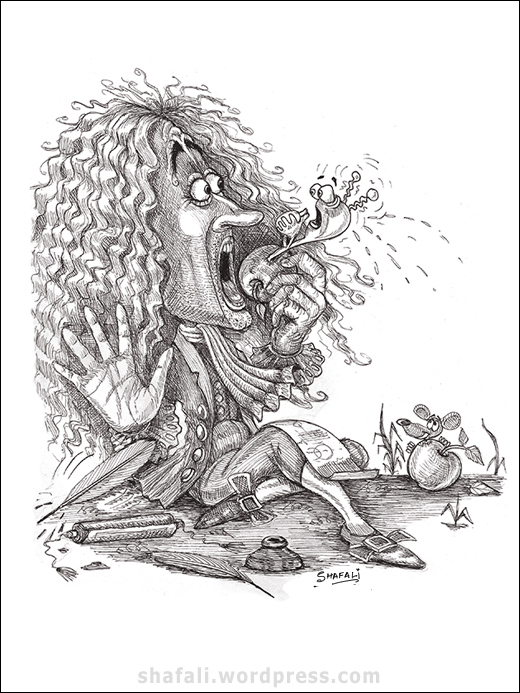 brace yourselves – caricatures are about to invade your world! I could list them out – all 10 of them, but then I’d kill the suspense – so I won’t. I’ll just tell you this that last week I received a package that gave me a shot in the arm. What was there in the package?! Well, it had some drawings that I am going to cherish forever. But why did they inspire me? Ah, that’s a trick question – isn’t it? Okay. Here’s why. Because I looked at those drawings and thought that one day…perhaps in not very distant future, I’ll wake up into a day filled with the possibility of doing nothing but drawing. Those drawings made me want to draw. So, that’s exactly what I did. I woke up the next day, and I saw nothing but the possibility of drawing. I drew and drew and drew…until I had drawn everyone whose photographs I found in my reference folder. …But true! 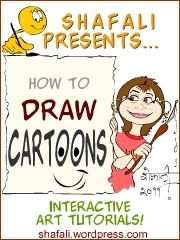 Your caricaturist is back…figuring out ways to get herself killed! And the end-note…to my idol in the world of cartooning. Thank you for inspiring me. Caricature/Cartoon of Neo a.k.a Keanu Reeves hacks into the Caricature Matrix! Neo has finally hacked into the Caricature Matrix! In this Caricature Matrix, everyone sees everyone else as a caricature of his real-self…and this is also true for Neo a.k.a Keanu Reeves, who appears here in his caricature avatar! I’ll be truthful. I didn’t know anything about this gentleman until I watched The Matrix, then The Matrix Reloaded, and then The Matrix Revolutions! Even then, I knew him only as Neo the hacker, who asked the multi-million Dollar question – What is the Matrix? He was this tall, slim, rubberband of a man who wore dark glasses and was never sure of his own potential, which everyone else happened to know about! I found Morpheous (played by Lawrence Fishburne) a far more interesting character…all Neo made me wonder through out the trilogy was why the heck was he interested in that emaciated, vertically stretched, Na’vi-like woman called Trinity, who wore shiny black body paint? I must’ve seen him in a couple of other movies…but I didn’t give him more than a passing thought…and even that passing thought was – why does he have those oriental eyes on an extra long non-oriental face? But I gradually began to realize that Keanu Reeves is a popular star…and he rules many hearts, including the one that belongs to our dear Barb. 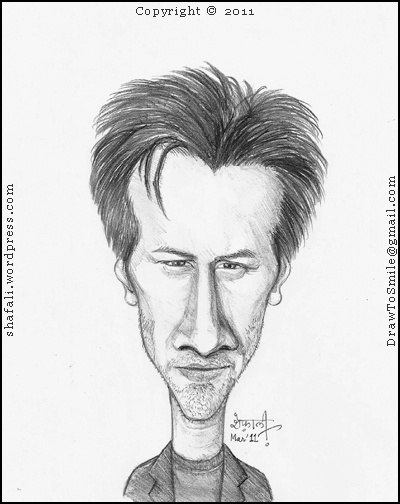 Please welcome the Caricature of Keanu Reeves to this blog! Keanu was born in Beirut, Lebanon, on September 02, 1964. His passion for stage an acting came from his mother and his oriental eyes from his father who had among his ancestors, a Chinese. His father abandoned his mother when Keanu was 3, and so he never had anything to do with his father. His mother moved from husband to husband, until she married the fourth time, broke up and decided to call it quits. Since Keanu’s mom moved to Canada after her second marriage, he spent most of his childhood there. Interim Update – The Asperger Syndrome? A comment made to this post made me research some more. Some experts believe that Keanu might have the Asperger Syndrome, which is characterized (among other things) by difficulty in maintaining meaningful social relationships and a quirky behavior. I guess Asperger’s might be a lot more common than what the experts believe! Keanu Reeves journey to stardom began with a movie about hockey (Keanu used to love playing hocky,) which was shot in Canada. Next he was seen in the movie, River’s Edge. His performance in this movie received critical acclaim but what truly established him in Hollywood was his role of Ted in the movie, Bill and Ted’s Excellent Adventure, a movie based on Time Travel.The next four years were a quiet time in which Reeves took more sophisticated roles. In 1994, he made an impact with Speed. The next few years were a low time for him, until the release of Matrix in 1999. Reeves’ Charisma is often attributed to the air of mystery that surrounds him. He took a cut of $2 Million on his pay so that The Devil’s Advocate could cast Al Pacino! He took a 90% cut on is pay for The Replacements. Why? So that Gene Hackman could be cast in the movie. I think that this sums up his journey rather well…For his first movie “Young Blood” he was paid USD 3000. For Matrix Revolutions he was paid USD 15 Million and 15% of the Gross! Read about the Photoshop Meme (and watch its video too), which shows a sad looking Keanu sitting on a bench, here. Could it be that he is immortal? Here’s why some people think that Keanu Reeves is immortal! They say he never married – they say he got married. Only Barb can tell. He neither accepts nor denies it, so…is Keanu Reeves gay? Well…Keanu’s sort of left-handed, but he plays bass (for a band called Dogstar) with his right hand. Guess that makes him an ambidextrous or…a freak? As always…thanks to Wikipedia and IMDb for being such fantastic resources of information. I like his work for his fine brushwork and smooth presentation. Visit Achille Superbi’s simple but interesting website here. 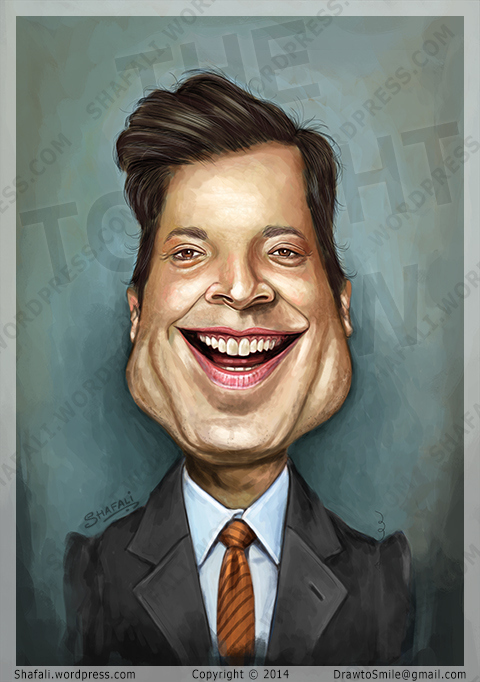 Click the following links to view some of his fascinating caricatures. See Achille Superbi’s caricature of the Beatles on a t-shirt here.